There’s much to be explored in the world of internet learning, especially when it comes to teaching people new skills that are in demand. With the rise of different online platforms, the opportunity is even greater for budding creators and even enthusiastic learners. If you are one of them, then this article on how to make money from Udemy is a must read. Udemy is an online teaching and learning marketplace that have over 55,000 video based courses and 15 million students worldwide. Ranking just third in the category of online education, the site gets about 80 million unique visitors per month. With such a large audience size, there’s no shortage of subjects that one can’t learn online and you can literally get involved with any of these categories. There are basically two ways to monetize from online courses – create and sell them or, promote other people’s courses. Each has its own unique proposition which may or may not fit your goals so let’s see what they are. People who choose to sell on Udemy are called instructors and they can choose to create as many free or paid courses as they like. Each course can be tagged with its own Google Tracking ID and Google Adwords ID so you’ll know how well they are converting through organic search or paid ads. Hosting on the platform is free, but you’ll need to get your own props for filming the videos. 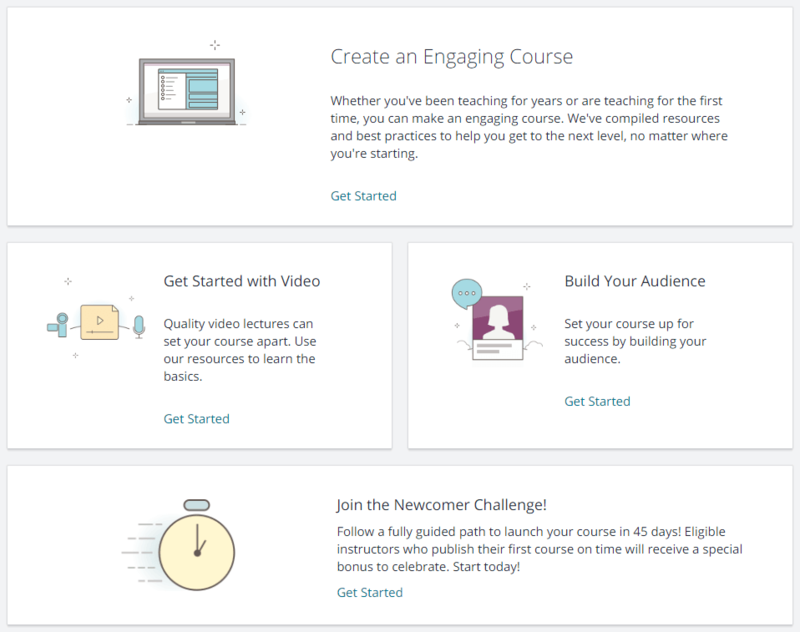 Inside the instructor’s dashboard, there are numerous resources to guide you through the process of planning, creating and eventually publishing a course. There’s also a peer to peer community that you can join to bounce ideas for creating a more engaging course. Udemy has provided a Price Tier Matrix to help you with setting the prices of your course. The minimum tier starts from $19.99 USD to a maximum of $199.99 USD. In the event of a promotion, the minimum sales price after discount is $9.99 USD. So, how much exactly will you earn as an instructor? It depends on which route your customers are signing up from. 1) If you choose to be part of the Udemy Marketing Boost program which partners with affiliates, you’ll earn about 25% in revenue share. The other 75% goes to pay for advertising costs and/or partner payouts for acquiring new customers. 2) If you rely on Udemy’s organic search and marketing efforts, you’ll earn 50% in revenue share. In this case, the user browses the marketplace for courses before making a purchase. 3) If you own a teaching website or blog, you can make promote directly through a coupon code and make 97% in profit. The remaining 3% goes to administrative processing fee. This method will require own generation of traffic to your site. This monetizing method is best suited for individuals who are specialize in a particular niche. It would be an added advantage if you have some experience teaching those subjects in real life. However, the nature of teaching may not be for everyone as creating courses can be fairly time consuming. So, here’s where the next option comes in. An affiliate marketer is someone who runs a niche blog and earn sales commissions whenever a customer purchase something (in this case, an online course) through their affiliate links. The niche could discuss about the features of different online learning platforms (i.e, Udemy vs other competitors) or specific skill-acquiring subjects such as entrepreneurship, photography, designing and etc. Udemy partners with Rakuten Linkshare network to acquire new customers through their affiliates. For every referral, the program pays 20% commission when the visitor purchase a course item within 7 days. Therefore, if a course sells for about $40, you’ll earn about $8 in commission. This is actually the part where instructors earn 25% of their revenue share. The program offers more than 50K product links and 700 banners/images, so everything is pretty much in place for you to start promoting on a blog. In order to achieve better sales conversion, you need to learn how to write genuine reviews and that means, taking and testing the online courses yourself. Many Udemy courses with 4-5 star ratings have a lot of positive feedback from students, but those comments are very brief and they often don’t provide enough insights into the content of the course. As a blogger, you can take over this role and come up with something more elaborated in your own voice to show the audience why they should (or shouldn’t) sign up for a particular course. A great way to funnel readers to your product review through the search engines is by addressing skill-related queries that are trending in a particular niche. These queries are in fact keywords that can potentially lead to more sales conversions. A good keyword should be targeted and has a low level of competition because it will help your blog rank faster on the first page of Google, thus getting more traffic. Depending on which tool that is being used, the name assigned for this metric can be different. In the Jaaxy keyword tool, for example, it is called QSR (Quoted Search Results). This tool is actually very easy to use and within minutes, I was able to come up with this random list of skills-related keywords – all with the QSR of less than 100. Attention: If you are an instructor who wants to build a loyal audience (remember the 97% revenue share that I mentioned earlier? ), you should also leverage from these low competition keywords to drive more sales for your course. That way, you can keep your customers and potentially sell to them again in the future. Do you have a keyword idea in mind for a particular niche? Enter in the search below and see what Jaaxy says. The accessibility to faster internet connection has made e-learning very popular and this business is growing rapidly on a global scale. By 2022, the market size is projected to surpass 243 billion USD and that leads me to the next question – what do you plan to do with your skills for the next few years to come? Working on a 9-5 job or perhaps, start an online teaching business? I am pretty sure you can find the answer somewhere in this article. Wrapping things up, it’s been exciting showing you how to make money from Udemy because discovering new tools and niches is what I strive to share on my blog all the time. If you like to know more about turning your passion into something profitable, check out my recommended training platform for more details. Have questions/comments about this topic? Feel free to leave them in the space below and I’ll get back to you as soon. With an ever busier schedule for everybody in the family alike, it can get pretty hard to learn new skills, languages, or even to learn to start a side hustle. But Udemy, like you have explained in such great terms, is the answer to the barrier that people may have when it comes to learning in general, and that’s the time! Thanks for writing about the different features of Udemy. Being an instructor there could actually result in residual income for those who have the passion for teaching, as opposed to having to show up in a class environment. This is really fantastic information. I use Udemy all the time, and even considered making a course to sell. I just didn’t know how to break into a category. I think being an affiliate for some of the many courses I’ve taken could be a better route for me to test the market. This is great information, Cathy. I did not know that you could be an affiliate of Udemy. I have never taken a course there, but I had been looking for an educational institution that would have an affiliate program to take advantage of. It seems that Udemy has quite some good courses for everybody. So what you need to do is set up a niche website that would teach people something, and then refer them further to a specific course on Udemy? That’s right Oscar. 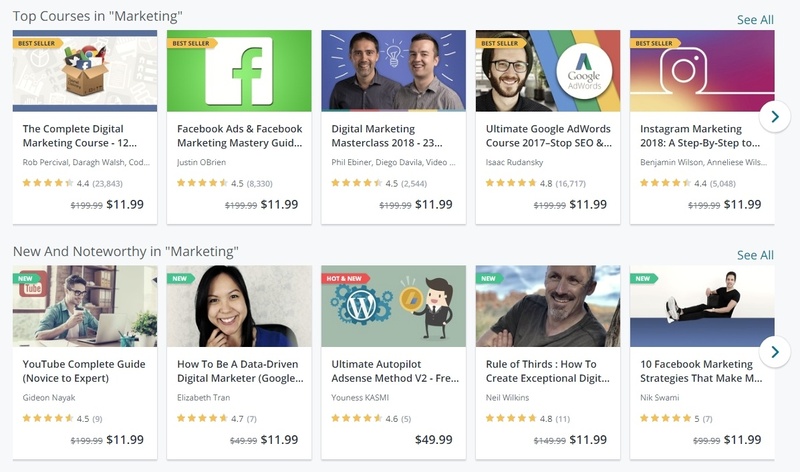 If you’ve yet to produce your own online course in a certain niche, then referring people to Udemy to learn new skills is something relevant that you can offer to the audience. As you can see, there are plenty of subject categories that you can leverage from. I have actually heard of a third way in which money can be made from Udemy, which is used by agencies. In short, they go down the teaching route, giving away courses for as cheap as possible, like a permanent sale going on for once every week with the aim of obtaining clients. The teaching course serves as excellent branding and awareness of their agency and many students end up hiring them to do the work (that is taught in the video training) for them. Many SEO and PPC companies actually do this. That’s interesting to know, Derek. Can you remember what those companies are called? It would be good to look up on their training courses, since it’s relevant to most of our readers here.